Hail, hail to the Rock N’ Roll Music Sale in Maple Grove Minnesota. Last week I went to their sale and came home with a major stack of wax. This is mainly a vinyl event – they have CDs (but I did not even look). 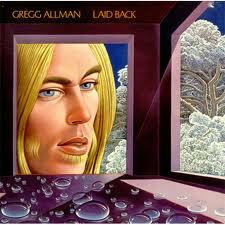 For about 25 years I have been listening to a CD of Gregg Allman’s Laid Back. It has been one of my favortite albums. I picked up a copy at the sale for $2.00. I finally got around to listening to it tonight and what a mind blower. It sounded fantastic. The first CD reissues were often very careless – grab whatever tape was available and burn it to digital. Maybe there are better version of the CD available, but I will be hard pressed to imagine any will beat this piece of vintage vinyl. This is a magnificent album. Highlights include Allman’s own “Midnight Rider” and Jackson Browne’s “These Days.” This LP had a whole different groove from the Allman Brothers of the era – much more of a singer songwriter groove. If you ever find this in a crate for less then $5 grab it. Amazingly my $2 version was in excellent shape both the vinyl and the cover (wonderful gatefold).